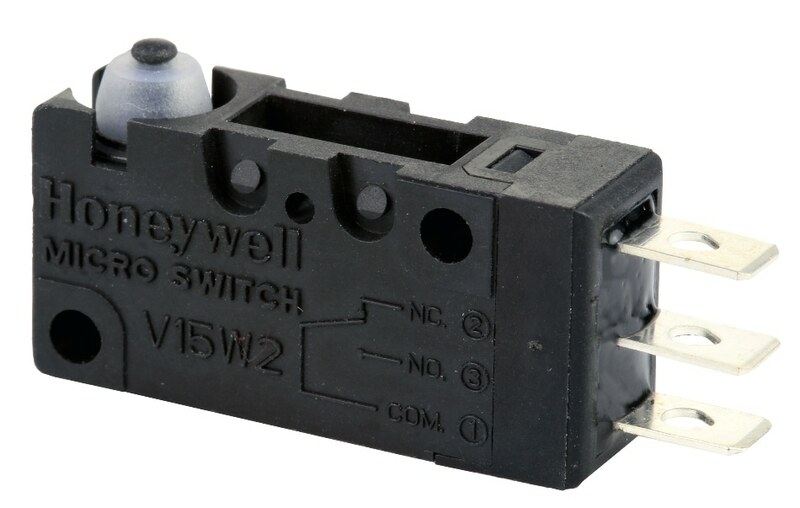 Honeywell today announced a new Micro Switch™ series designed for use in household appliances and other hazardous locations where flammable gasses may be present. The V15W2 Basic Switch is an explosion-proof-rated, snap-action, electromechanically sealed switch designed for applications such as commercial appliances, valves and actuators, commercial refrigeration, ice makers, and HVAC/R (furnace, refrigeration, and ventilation). In a typical household refrigerator, these switches can be used to control the production of ice in a freezer or turn on an interior light when the door is opened. The cost-effective, sealed switches are designed for use in Zone 2 hazardous locations, which are classified as an environment where a mixture of air and flammable gas or vapor is not likely to occur in normal, day-to-day operations. In addition to ice makers and refrigerators, the switches can be found in generators, compressors, damper equipment, extraction ducts and valves. The miniature, basic switches offer repeatable, consistent performance over the life of a product to provide control and safety within a wide range of difficult environmental conditions. Honeywell pioneered the Micro Switch, which was invented in 1932 and can be found in products ranging from aircraft to vending machines. Honeywell’s cost-effective switches offer durability, repeatability, reliability, high current capacity and a small size. More information about the new line can be found by visiting https://sensing.honeywell.com/switches.